in St st with A on larger needles. 35½ (40, 44½, 48¾, 53¼, 57½, 62, 66½)" circumference at underarm. Pullover shown measures 40"; modeled with 6" of positive ease. This pattern is available from interweave.com for $7.99. 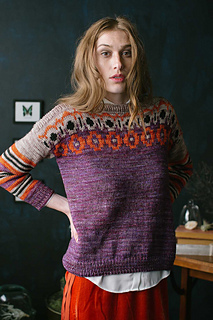 The colorful, whimsical Arge Humeralis Pullover is based on the patterning of the Poison Ivy Sawfly (Arge humeralis) in its larval, or caterpillar, stage. 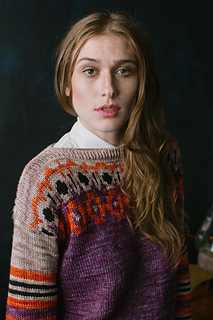 This graphic pullover features a stranded pattern of dots and bumps in a hand-dyed yarn for an organic look. 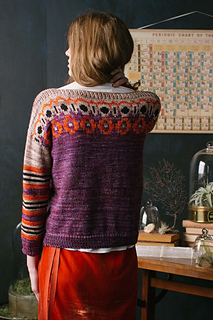 The sleeves are worked with a series of stripes that mimics the color distribution of the stranded patterning on the upper bodice, creating a geometric contrast to the main body. Finished Size 35½ (40, 44½, 48¾, 53¼, 57½, 62, 66½)“ circumference at underarm. Pullover shown measures 40”; modeled with 6” of positive ease. Yarn Malabrigo Yarn Rios (100% superwash merino wool; 210 yd / 3½ oz): #RIO136 sabiduria (purple; A), 3 (3, 4, 4, 5, 5, 5, 6) skeins; #RIO016 glazed carrot (orange; B), 1 (1, 1, 1, 1, 2, 2, 2) skein(s); #RIO131 sandbank (gray; C), 1 (2, 2, 2, 3, 3, 3, 3) skein(s); #RIO195 black (D), 1 skein. Needles Sizes 6 (4 mm) and 7 (4.5 mm): 32” circular and set of double-pointed. Adjust needle size if necessary to obtain the correct gauge. Notions Markers; removable markers; tapestry needle. Gauge 20 sts and 26 rows = 4” in St st with A on larger needles. 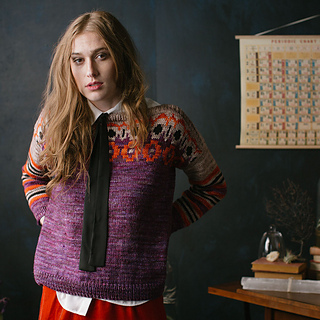 This pullover is worked in the round from the bottom up. Additional stitches are cast on at the underarm for armhole steek panels. Stitches for the sleeves are picked up around the armhole and the sleeves are worked in the round from the top down. The charts are worked using the stranded method. Always pick up the background color over the pattern color and pick up the pattern color from under the background color; this will prevent tangling. Keep floats loose. For floats longer than four stitches, tack stranded yarn on wrong side of work. If necessary, use a larger needle for the charted rounds to maintain gauge. On the sleeves, when the contrasting color is unused for only a few rows, carry it up the side of the work and bring it under the main color to begin working with it again. When there are more than four rows between color changes, break the yarn at the end of each stripe, leaving a 6” tail.